GLEE IS BACK! Hurray! Especially after such a cliffhanger... SPOILER ALERT! First off, I'm glad Quinn is alive, though in a wheelchair. What I didn't like, however, is how the show just snaps back to Quinn back at school, and her positivity/denial are a bit annoying and immature. I think the show missed out on some intense hospital/recovery moments, though we have already had some hospital time already with Quinn and Burt, respectively. I don't know, it just wasn't handled that well. Poor Quinn. Teen pregnancy, losing her head cheerleader spot, parents' divorce, reveal of her ugly past, AND a car accident? DON'T TEXT AND DRIVE. Sheesh. The hits just keep on coming for the blonde popular girl. But really, this episode was focused on Blaine and his brother, Cooper. What a character! Seriously, a hilarious and loathsome character, so self-absorbed... "To be a great actor, point your finger and shout your lines like Nic Cage!" 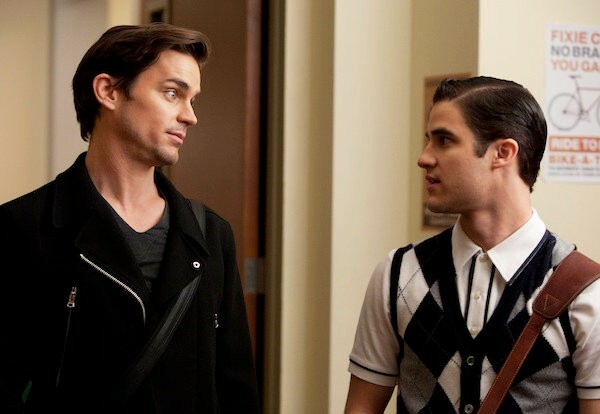 I really enjoy Blaine's singing, though he really used to annoy me last season. He gets a lot of airtime, when I'd like to see some more Rachel/Mercedes/Puck/Santana. Despite that focus on the Anderson brothers, I was SO happy to get my Sue Sylvester back. The cheeky one-liners, the hilarious storyline... I need more Adidas sweatsuit action! Also love the rivalry with Nene Leakes' character, Coach Roz... I was like, "OMG, did she just tell Sue to talk her Centrum Silver? Bwahahaha!" Anyways, I obviously have problems blogging coherently today, but I'm so happy to have my show back. It hasn't completely jumped the shark, though it's seen better days... I'm hopeful for a good conclusion to the season.